For news of my latest workshops please go to this page. If you are interested in learning how to make a piece of stained glass you can join a day’s workshop and help raise money for charity. I am supporting a small charity working in Hikkaduwa, Sri Lanka, helping to rebuild children’s lives following the Tsunami disaster in 2004. Eddigoeseast is an arts education and well-being centre working to support children and adults in Sri Lanka and was set up after the terrible tsunami of 2004. Just £3 buys an hour lesson in IT, music, Kandi dance, photography and more. All teaching aims to nurture and educate children to develop self esteem and well-being. All money raised (taking out the cost of materials) goes directly to the Sura Medura Arts Centre and provides for the education of children and adults living in the area. Spend a day learning to cut glass to a pattern, cut and shape lead and solder a piece of stained glass. Would you like to learn the basic skills of copperfoil stained glass? 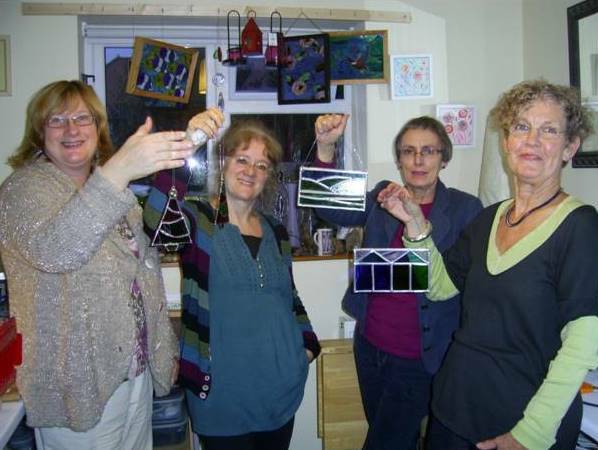 Spend a day learning to cut glass to a pattern, foil and solder a piece of stained glass. Suitable for anyone not wanting to work with lead. In a day you can learn to cut and shape glass and lead safely and then solder together a small design to take home, eg a beach hut. You pay £40 (which includes the cost of materials for one piece) and the day runs from 10am to 4pm, including lunch and drinks throughout the day.